After sipping tea in Ridgeway, we stopped into nearby Carolina Adventure World, perhaps the ultimate dream retreat for ATV enthusiasts and dirt bikers. Quite a change of pace, but we like it all!! This attraction is tucked into the mountains and offers 100 miles of trails, 10 miles of dedicated dirt bike tails, a banked oval track and multiple mud bogs. Plus, they recently added horse trails. It's the Southeast's largest ATV-UTV and dirt bike riding park. 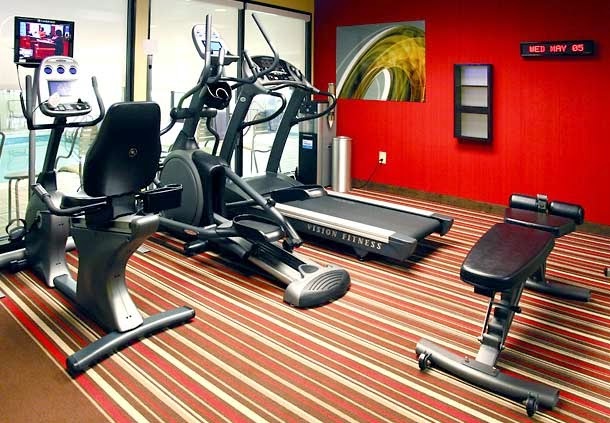 Guests can rent all the equipment they need or they can bring their own. 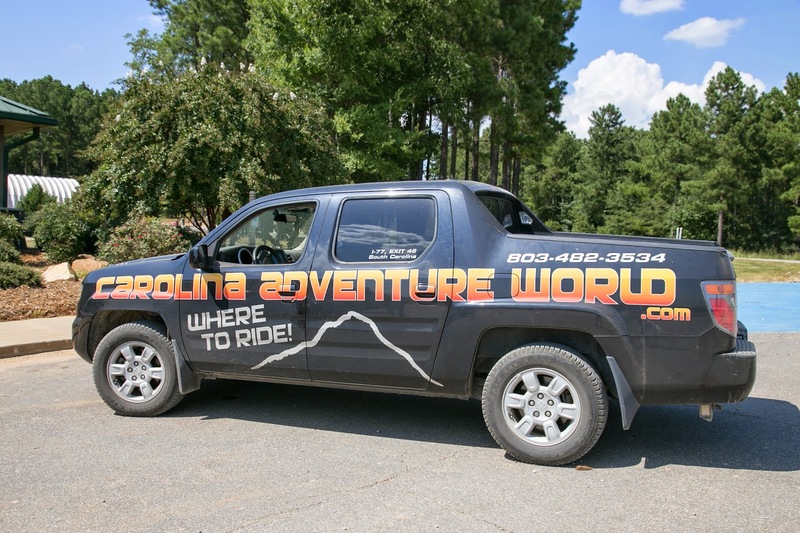 Carolina Adventure World is located in Winnsboro, SC. Guests can rent cabins and campsites or bring an RV to their facility which has electrical and water hook-ups, bath and shower house and barbeque and fire pits. Everything for a weekend of adventure. We ended the day in Rock Hill, South Carolina at the Courtyard by Marriott Rock Hill. This hotel was the winner of Trip Advisor's 2013 Certificate of Excellence and Marriott's 2013 Silver Award. We were delighted to discover this Marriott was rather extraordinary. 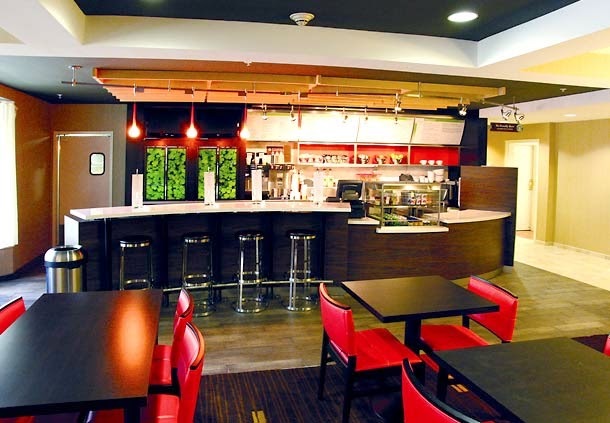 The lobby offers a sitting area and a bistro area where guests can order freshly prepared choices from the breakfast or dinner menu, a cocktail or a Starbucks beverage. The little cafe is terrific; we walked in and had a glass of wine after a long day of touring. Others came up and ordered from the posted menu and a server brought out the food. You can sit at a table or the bar or ask for take-out. Some beverages are self-serve. We found the breakfast choices were healthy and just what we wanted: quick, tasty food at reasonable prices. The guest rooms are over-sized with "dream bedding" - which, in fact, was dreamy - a coffee marker, and free high speed Internet. This hotel is perfect for a business traveler and also for groups. We met an interesting group of athletes staying over the weekend. We had no time for the fitness gym or pool, but they looked nice! 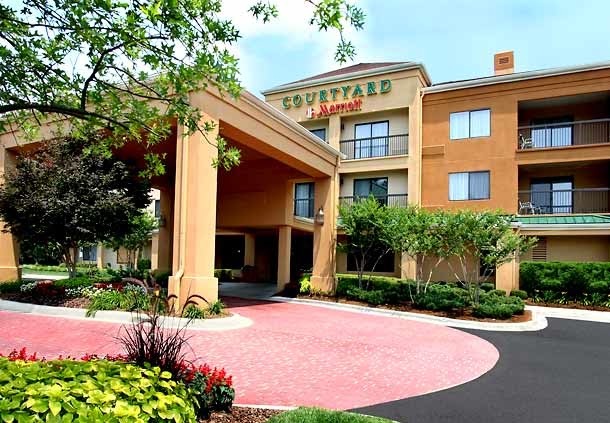 We give the Rock Hill Courtyard by Marriott our highest recommendation. Fitness Room we did not use! How big must a town be to be worth visiting? Not very if Ridgeway, population 330, is any example. We headed there for lunch at Laura's Tea Room and the Thomas Store Deli and were soon charmed by the tiny town. The one-block downtown, three-block residential town sits smack in the middle of what once was the Catawba people's hunting grounds. Much of the surrounding land is still used for hunting only now it is in the hands of private hunting clubs. The population of the whole county is a mere 26,500. Small town, small police station. Look quickly as you enter town or you will miss the world's smallest police station, now a help-yourself visitor's center. Carrabelle, FL, also claims it has the smallest, a phone booth. Ridgeway's is just large enough for wooden desk, a rotary telephone, a small file cabinet and a small wood stove, so it was more of a true station than a place for police to make phone calls. The new police station one street over doubles the space. Miss Laura's is in the Thomas Building. Laura's is owned by Carol Allen and named for Miss Laura, the last member of the Thomas family to run the mercantile that once filled the circa 1911 building. The deli and shop are downstairs, the tea room upstairs and the baking is done by Grama, Carol's 93-year-old mother. Many thought Carol crazy when she opened here in 2008, but the enterprise is still going strong and garnering rave reviews. The library ladder of the old mercantile store is still used. Downstairs is a fun shop, the deli and dining area. 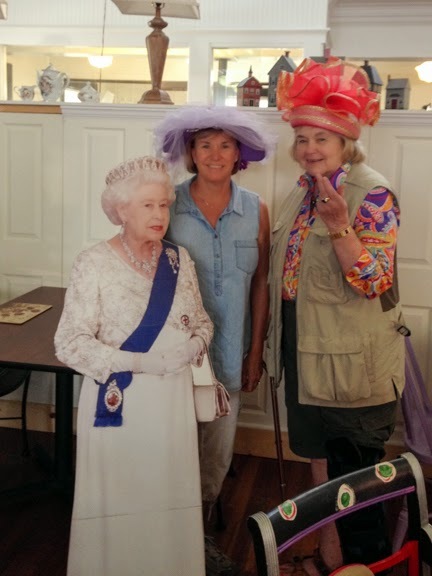 A little "Downton Abbey" tea? Upstairs is the dedicated tea room which, if you didn't wear your own chapeau, comes with a large selection of loaners. The Good girls in their "loaners". We saw several mother-daughter-granddaughter combos that were having a lovely dress-up time. The tea and food are good, too., and reasonably priced. Mrs O'Brien's Quiche (broccoli and cheddar), served with a salad of mixed greens, fruit and veggies, is $8.95. Upstairs teas are by reservation; afternoon tea is $18.95, the High Tea $26.95. Menus for these change but you will always find sweets and savories. If they have the ginger peach black tea, don't miss it. We took a quick, post-lunch ramble down Palmer Street, ducking into the cute accessories shop next door. Alas, not time for retail therapy. We could have spent even more time at the antiques shop across the street and especially Ruff & Company Hardware. The old wooden hardware store is adjacent to its new - 1901 - replacement. The old store, circa 1840, is next to the "new" one, built in 1901. It, too, has a library ladder, still in use, but its shelves are chock-a-block full. The wooden floors have that walked-on spring and the range of merchandise spans as many years as the store itself. We met owner Dan Ruff behind the cash register. He's the sixth generation to punch its keys and has as many stories to tell as there are items in his store. We yearned to stand around and hear them but he was busy and we had more places to see. However, is would have been a crime to miss his unique, mule shoe filing system. Dan Ruff and his mule shoe filing system. Camden, the first inland city founded (1732) in the state, is my kind of town. Gracious homes, many of them antebellum, sit regally on large, heavily-treed lots, and signs of horse culture are everywhere. A horse-lover since birth, my nose twitched happily at the familiar aroma of leather and hay and my eyes spied the signs from horse-fenced pastures to the ones warning riders that horses are not allowed on the sidewalks. Suzi Sale, tourism development director for Camden, filled us in on some of the city's history. Camden was on the Catawba trade path and King Haigler, whose face we had seen on Catawba pottery, is considered its patron saint for all the help he gave early residents. The town had a large British presence, including General Cornwallis, and the Battle of Camden (August 1780) was one of the patriots' biggest losses. The next confrontation a year later, the Battle of Hobkirk's Hill, although a loss for the Patriots, prompted the British to abandon the city. 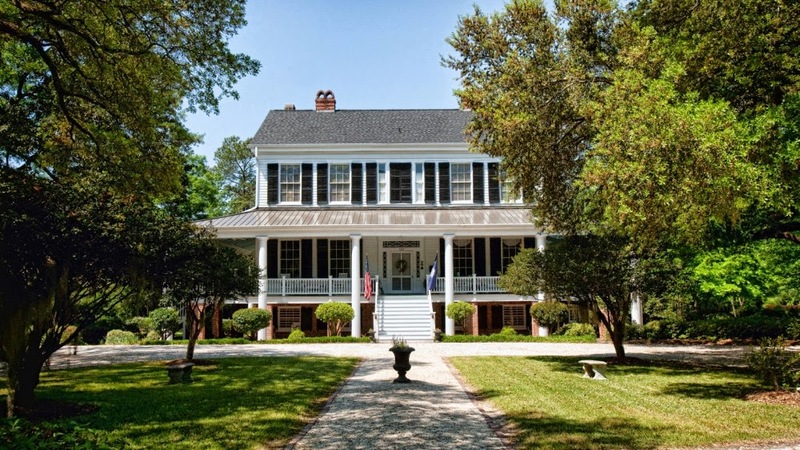 Bloomsbury House, built between 1849 and 1854 by South Carolina's third-richest man for his daughter, is now the Bloomsbury Inn, a bed and breakfast. During the Civil War, Sherman's troops didn't go through Camden, sparing its homes for future generations. 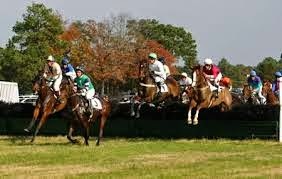 Today, the invasion is of equine enthusiasts who swell the town's population by 10,000 February through April for the Carolina Cup steeplechase in March (March 28, 2015) then return for the Marion du Pont Scott Colonial Cup in November (Nov. 15, 2014) at Springdale Race Course. Between those, the Camden Training Center and the South Carolina Equine Center, Suzi said there's an equine event of some sort every weekend year-round with the season running late September through May. A life-sized statue of Lonesome Glory, five-time Horse of the Year, fronts The National The Steeplechase Museum . It made sense to locate The National Steeplechase Museum, the only one in the country, in the Steeplechase Capital of the world so that's where we headed next. Colors of Mrs. George M. Sensor, owner of 2014 Carolina Cup winner Top Striker. Colors of Gregory D. Hawkins, owner of 2013 Colonial Cup winner Alajmal. At the entrance of the Camden cottage-style building you encounter two lawn jockeys painted in the colors of the most recent winners of the Carolina and Colonial Cups races. Inside, if you're lucky, you meet Hope Cooper, executive director. Hope gave us a tour of the museum and information about steeplechasing, which, like all other forms of racing, began when one owner turned to another and said, "Mine is faster than yours." In Ireland and England during the 17th century, church steeples were the most easily points for starts and finishes. Racers had to negotiate any obstacles - walls, hedges, creeks - in between and the steeplechase was born. When the numbers of proud horsemen grew, courses were laid on which more than two horses at a time could race and the sport as we know it today was formed. By the mid 19th century race meets were being held along America's East coast. 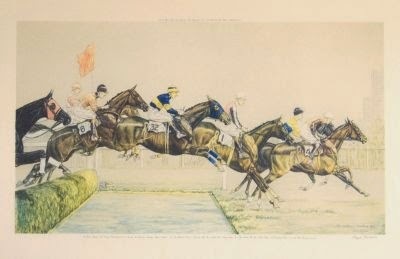 Scene from The Grand National by Paul Brown. Since 1927, steeplechase racing has been a highlight of life in Camden; the museum is adjacent to Springdale Race Course. Today there are two divisions, steeplechases with wooden rail jumps and those with brush jumps like large hedges. The Carolina Cup falls in the latter category. Races are 2 to 2 1/2 miles in length with 12 to 17 fences and last about 4 minutes. Steeplechase riders weigh in at around 130 pounds compared to flat race jocks at 112 pounds. Most are from England and Ireland; only one American rider was on last year's card. Unlike Thoroughbreds that race at 2, steeplechasers aren't allowed to race until the age of 3, giving legs an extra year to strengthen for the jumping efforts. Purses are smaller and oh, in South Carolina there is no pari mutual wagering, putting steeplechasing more on the level of a sport than a business. Jockey silks surround the second floor cupola. The museum is spacious and airy with silks of winning owners displayed around the second story cupola. Winners' plates and trophies fill niches, paintings and photographs of influential participants and famous horses on the walls. In the library are 19 originals of England's The Grand National, the pinnacle of steeplechase races, by famed equine illustrator Paul Brown. It wasn't the time for Judy to get in the saddle. A favorite is the "trainer," a mechanical horse tacked with a race saddle that visitors can mount and see just how strong a jockey has to be. Hope Cooper shows Debi the proper racing form. Debi was laughing but admitted it was a lot harder than she expected. I was dying to try it but with a slippy hip and knee-immobilizing brace, Debi had to do the honors. Yet another "next time". Walk out to the patio and you can see the grounds of Springdale Race Course. Makes you want to sit, relax and wait for the next race.